Paul Franklin is one of the four British visual effects technicians hoping to win Oscars on 22 February for their work on The Dark Knight. Here he explains how his team at London effects house Double Negative created the following scene, which features towards the end of the Batman blockbuster. Director Christopher Nolan aimed to ensure The Dark Knight was firmly grounded in a real world audiences would recognise and relate to. To that end he shot large parts of the film on location in Chicago, which served as the basis for Gotham City. During Batman's final confrontation with the Joker, he must prevent the Joker's hostages from being accidentally shot by the SWAT team that is assaulting the building. Batman appears to have been captured but at the last moment, he pushes one of the SWAT troopers out of an open window who pulls the rest of the team out with him. 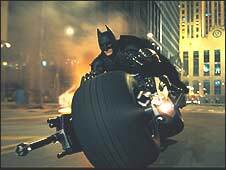 In order to make the scene look as real as possible, The Dark Knight's stunt department set up a spectacular stunt. 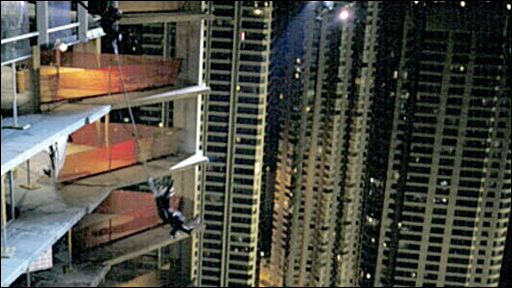 Several stuntmen were roped together and jumped out of the side of an actual skyscraper on location in Chicago, hundreds of feet above street level. To make the stunt as safe as possible, huge crash mats were fixed to the side of the building. In order to complete the shot, the visual effects department then carefully hand-animated matte shapes around each of the falling stunt performers so as to isolate them from the background. The whole side of the building was then recreated with computer-generated imaging (minus the crash mats) and carefully lit to match the flickering illumination provided by a helicopter spotlight. An extra upper storey was added to the building to hide the ramp from which the stunt men exited. The final shot was broken down into two sections for use in the finished film. As with the rest of the scene, this shot was created in the IMAX format which is much taller than standard widescreen. Nick Davis, Chris Corbould and Tim Webber have also been Oscar-nominated for their work on The Dark Knight's visual effects. Do you agree with the Oscar winners?